Last time, I compared LeBron James to Genie from “Aladdin.” This time, I’m thinking about the end to “The Hustler.” I’ll have to give you a bit of a rundown of that movie to get to the point, so let’s just say SPOILER ALERT for those of you who have not seen “The Hustler.” And if you have not seen it, well, go. Now. The older I get, the more I think it is the best sports movie ever made. The movie is about a pool shark named Fast Eddie Felson played, of course, by Paul Newman. Fast Eddie is kind of a genius and also kind of a knucklehead. He’s charming, and goofy, and he believes he can sucker anybody, and he’s probably right. His genius is pool. It’s clear that he can play the game the way Greg Maddux could pitch, that is to say on a level above. He has been using that genius by traveling from pool hall to pool hall with his partner, Charlie; together they work many different kinds of hustles. But Fast Eddie — though he has a hard time explaining it — wants something bigger than money. He believes that his goal is to be the greatest pool player in the world. And he knows the only way to do that is to beat the best, Minnesota Fats, as played by Jackie Gleason. Fast Eddie shows up at the pool hall, and plays an epic match against Fats. He drinks, and he plays, and he gets up $18,000. He’s so brilliant that at some point Fats considers quitting. But a shady gambler named Bert Gordon (played by George C. Scott) tells Fats to stick with it. “He’s a loser,” Bert announces. Fats washes up, straightens up his clothes. powders up his hands, walks over to Fast Eddie and, as fresh as morning, announces: “Fast Eddie, let’s play some pool.” Fast Eddie starts laughing — a sad, drunk, uncontrollable laugh. He loses everything. And he’s left a broken man, begging for one more game at the end. “Why’d I do it Sarah? Why’d I do it? I coulda beat that guy. I coulda beat him cold. He never woulda known. But I just had to show him. I just had to show those creeps and those punks what the game is like when it’s great, when it’s really great. You know, like anything can be great. Anything can be great. I don’t care: Bricklaying can be great … if a guy knows. If he knows what he’s doing and why, and if he can make it come off. I think this is Newman’s greatest performance in a lifetime of great performances. When he’s giving that speech, you can tell how amazed he feels to be saying those words, how he may have thought them before but had never dared say them. It’s self discovery. He doesn’t want to just be the best. That’s too bland. He wants to play pool like no one has ever played it before. He wants to make shots that nobody’s ever made before. But as the movie goes on, he comes to realize that this is not what the real world is about. Reaching for that peak gets your thumbs broken. Over time, Bert gets his hooks in him. He plays a drunken millionaire in a game of billiards and sees what it means to destroy someone. And finally, most dramatically, Sarah comes to a terrible end. Last, we’re at the final scene, and Fast Eddie is no longer a knucklehead. He’s no longer charming and goofy, no longer believes he has the ability to fool people. He’s without illusions. He shows up at the pool hall, challenges Fats to a match for $3,000 a game, every penny he has. “You were right Bert,’ he says bitterly. “It’s not enough to have talent. You gotta have character, too.” And then, he seriously and without any apparent joy takes apart Minnesota Fats. It’s a destruction — a joyless, vacant and resolute destruction. No liquor this time. No joking around this time. No hustling. He is focused entirely on the game, entirely on crushing Minnesota Fats and winning. That was all. Winning. I thought about that scene again and again while watching LeBron James on Thursday in Boston. James’ performance was astounding enough — he broke the Celtics all by himself. He scored 30 in the first half, 45 points in all, grabbed 15 rebounds, dished out five assists. But again, bigger than numbers, he broke the Celtics. For an extended period of time, he simply did not miss a shot. On one follow up, he jumped so high he seemed to dunk the ball with his elbow. The Celtics kind of hung around, but you could feel it: With LeBron playing like this, they had no chance to actually win the game. They knew it. They could plug away and hope the winds shifted. But mostly, it was hopeless. They could put two or three or four men on him, but there was no stopping this LeBron. He was inescapable. Beyond that, though, there was LeBron’s demeanor. You saw it. Everybody saw it. There was no smiling. There was no joking. There was no complaining to the officials on every play. There were no celebrations after made shots. The halftime interview was blunt and without emotion. The interview after the game blunt and without emotion. There was just … cold and steel. I think this is what I meant about that dark place people must go to bring out the extremes of their talents. LeBron had come to Boston to conquer, and I would say he looked, acted and played fundamentally different from any time I’ve ever seen him. The fact he scored 30 points in a half was not the telling point — he’s done that before. The fact he scored 30 points in a half in Boston, in Game 6, with the season at stake, with the dream on the line — no, he’s never done that before. And it was clear from his demeanor, his purposeful glare, his unsmiling face that this was exactly what he had come to Boston to do. A few readers have written in to say that the expectation of LeBron James is ridiculous — nobody is good enough to just go out and score 45 points and dominate a great basketball team based on sheer will. I think that’s right. LeBron scored 45 on Thursday in large part because his outside shots went in. Other nights they will not go in. But I will say that I don’t think there has ever been a basketball player — not Jordan, not Magic, not Bird, not Oscar, not anybody — who can dominate a game as many different ways as LeBron. When he’s driven like that, when he’s locked in and focused and aggressive and impossible to distract, I think he’s as close as we have ever seen to limitless. Is that unfair? Sure it is. But this is also a man who calls himself King. I remember when Cleveland was playing Boston in the playoffs in LeBron’s last year there, it was my deepest ambition to see this serious and adamant version of LeBron. He would not or could not go there. He played the worst game of his playoff life; he was a barely recognizable version of himself. After the game, he complained that people wanted too much from him. His next time out, he had a triple-double, which included 19 rebounds, but there were other numbers like 8-of-21 shooting and nine turnovers. The Cavaliers surrendered in the final 90 seconds. LeBron took his talents to South Beach. Last year, when I was desperately rooting against LeBron for the fun of it, it was a serious worry that we would see this adamant version of LeBron in the Finals against Dallas. He would or could not go there. He played an even worse game than he had in Game 5 against Boston on Tuesday, then had another triple-double that didn’t feel like a triple-double until you saw the box score, then he did not want to shoot the ball at the end. 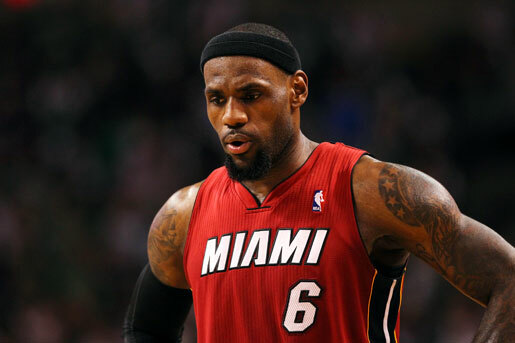 Thursday, he showed the adamant and serious LeBron. He was terrifying in his single-mindedness. I always thought the wonder of “The Hustler” was the way it fused and separated winning and losing. At the end, Fast Eddie won the game while he lost his wonder. I don’t think it’s that stark for LeBron, but I also say that something in him shifted Thursday. When LeBron has played beautiful basketball, it always looked like so much fun. He has that gift of transmitting joy and happiness; nothing in the world looks more fun than playing basketball like LeBron at his best. Thursday, did not look fun. Maybe it was, maybe it wasn’t, but in the end that was entirely irrelevant. The Heat won big. The series is going back to Miami. LeBron had imposed his will. And fun had nothing to do with it. joe, you’re such a joy to read. everything you write just resonates with me, and making me contemplate everything from snuggies to king james. he just had the look last night, and no one was taking that focus away. nothing. An utterly insane performance in a career full of them. I can’t get it out of my head. Lebron James was good too. I think Wilt had the same ability to completely dominate a game by himself. And I think he, too, preferred to enjoy the game. But I recall one game where he got pissed at the other team for cheap hard fouls, and went on a streak of like 6 straight made shots (despite more cheap hard fouls and a couple of free throws), and blocked three shots at the other end, and got the rebounds on the other three shots. A close game became a blowout. And then he started smiling again, and coasted to victory. The other player (any sport) I’d put there was Koufax. There are reasons why everybody talks about him that way. If you wanted to put Carlton and Gibson on that mound, I wouldn’t argue. I think the most fascinating part of all of this is whether it represents a shift in how he plays from this point forward or if it was a one off. I want to believe it’s the former, but I can’t help but think/worry it’s the latter. That kind of intensity just doesn’t seem sustainable. Joe uses Jordan, Kobe, etc. for example of players who are capable of entering that “dark place” where a professional athlete can play at his highest level. The difference is, those players never seemed happier than when they reached that point and their game was driven by that single minded objective of winning. Even Jordan’s famous shrug was preceded by that little half smile/smirk. In contrast, it seemed as if LeBron took absolutely no joy from last night’s game at all. Which makes it all the more impressive, but I can’t help but think it makes it impossible for him to go there one more time, let alone five more times. It was a great performance, no doubt, but the Celtics can win game seven if the refs choose to make it happen. Every time I get sucked into an NBA game (and this upcoming game seven qualifies), I see the refs determine the outcome. For all the complaints about baseball umpires (baseball’s my favorite sport), for all the lousy ball/strike calls, I never see an umpire in baseball just determine the outcome of an MLB game. And yet it seems to happen all the time in the NBA. I’m not some ignorant fan of basketball (the way I am for soccer, each World Cup). I grew up worshiping the 80s Celtics, mostly walking away as Bird retired and I left for college out of state (thus losing my favorite player and easy access to news about my favorite team). I understand the sport pretty well, and I can’t believe NBA fans tolerate this. LeBron is an amazing talent. There’s no doubt that the Heat deserved to win last night, not when the other Celtics were so rarely ready for Rondo’s passes and not when they blew a nice chance to chip away at the lead going into the half. But I fully expect that I’ll turn off game seven in disgust at some point, say, “They’ve decided that [Boston/Miami] is going to win this game” and find out in the next morning’s paper that I was right, that the winning team will have attempted twice as many free throws as the losing team. I’m convinced the fixing scandals go well beyond Tim Donoughy. What’s most astounding is that this historic game was 50% over his points and rebounds for the series so far, and average for assists. Now, if someone who is a 16/8/2 has a 24/12/2, we might comment that it’s a big game, but not that it’s transcendent. But his normal is so amazing that when he raises it up a notch, it’s unbelievable. As to Josh’s comment about the refs, last night was EASILY the best reffed game of the series, perhaps of the playoffs. But I think that’s endemic to really high level basketball. The game moves too fast, and there is a potential call on every play. It’s much as when NFL players will say that a ref could call holding on every pass play. There are a lot of calls that could go either way. Last night, watching on replay, it sure seemed that they got well over half of the 50% calls right in slow motion. That’s actually pretty good. Both of these teams are insanely physical. KG has never set a legal screen in his life. (Don’t get defensive. He’s a 1st ballot hall of famer, but he always moves and bends over on his picks. We’ve seen it so often that they let him get away with it. But he could be called almost every time.) Dwayne Wade and LeBron both like to attack the center of a defense, which means that there will be contact and slapping and people falling over. Rajon Rondo is perhaps the best, sneakiest basket attacker in the game right now. All of the Heat defenders except Chris Bosh like to front, which is always a leaning, snarling grab fest. Ray Allen’s game involves running his man into a mathematically impossible number of picks, which creates traffic jams and bodies flying. And don’t get me started on Paul Pierce, who has, for 14 years, has put on a clinic in getting calls simply with herky-jerky movements on your jump shot, whether hit or not. This is all part of the game, and part of what makes this series so special. And the refs, in this game, did a pretty good job of calling the fouls that actually effected the play in question, and not calling the ones that didn’t. In game 4, the refs were a bad joke, and I agreed with you. The “foul” that eliminated Pierce in game 4, which was basically cutting across the lane, was insane, and I still can’t figure out what LeBron did that was against the rules on either his 5th OR his 6th foul. Meanwhile, Wade mugged Rondo on a drive so badly that he shouldn’t have been called for a foul. He should have gotten 1-3 months. That game was marred by the refs. But last night’s game? KG got a bad T, which I don’t mind because he runs his mouth so much that he’s going to get T’ed up sometimes for saying things we can’t hear. LeBron was incredulous that he got called for a T that seemed clear to me he had to be called for. While some calls went the wrong way, that seemed to be pretty even. The reason there is a disparity in the number of free throws has a lot to do with style of play. Rondo is the only Celtic who routinely attacks the rim on dribble penetration, and he prefers to slither than to take contact. (That’s a good choice. His slithering seems to always lead to either a bucket for him, a bucket for someone else, or a wide open 3. LOVE me some Rajon Rondo!) KG has been a jump shooter, so he doesn’t get calls. Ray Allen is a jump shooter. 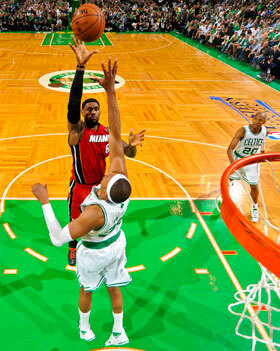 Pierce last night was a jump shooter. Why would you expect them to get any calls? Calls happen when you attack. The C’s weren’t doing that last night. The refs called a good game last night. Hammer them when they deserve it (Games 2 and 4), but not when they don’t. I agree that there last night was a well-officiated game. Absolutely. I was sort of confused that they miss a kicked ball, but no one’s perfect. When there’s suspicious officiating (from my perspective), I definitely account for differences in style of play. You’re going get a lot more calls driving to the basket than launching threes. The box score tells me a lot, but not everything. This is a side comment, but I think basketball would be vastly improved if they made the court bigger. The players are so much more athletic than in the past; the court’s just too small for them. It’ll never happen because widening the court would be at the expense of the most expensive seats. But I can dream. The Fast Eddie scene with Sarah. Josh, you’re crazy. Are we to believe that the refs will award twice as many free throws to the Heat, will get one of the Celts marquee player in foul trouble early, and leave LeBron with no fouls so he can play as aggressively as he wants throughout the game? Just because in this game 7 that the Heat had 27 free throws to the Celtics 15, and just because Garnett got his 2nd foul early and had to sit, and just because LeBron played 47 minutes and had 0 (zero) personal fouls doesn’t mean the refs are biased. How dare you compare someone with zero rings to the likes of Bird, Magic, and Jordan. Just because he scored 45 points in a game and didn’t epitomize his egocentric, immature, and “I’m King” attitude for once doesn’t mean you have to act like the world stopped spinning. The Gollum-esque obsession with rings by some fans is annoying. Blaming great players in team sports for not winning championships, regardless of how well they play in championship games/series is dumb. Yea this “He doesn’t have a ring!” meme is getting old. MJ didn’t get his 1st ring until he was 27. LaBron is 27 this year. People need to realize this guy grew up w/o a father and was on the cover of SI when he was 15 or whatever age it was. I remember watching his HS game on ESPN. You cannot expect this guy to act like a normal person when he was not brought up in a normal enviorment. I acknowledge the fact that he is an incredible player who was, in my opinion, most deserving of the mvp award yet again. It just bothers me when Lebron lovers get upset with Lebron haters don’t give him the “respect he deserves.” Simply put, it is my opinion that when you’re the mvp and all eyes are on you in every game, you have to live up to a higher behavioral standard. He has come a long way I’ll admit, but his Dwight Howard-esque diva attitude in seasons past don’t cut it for me. And William, please open your eyes and realize that not having a father around in one’s upbringing is so much more common than you probably think. I bet half the nba is that way. Plenty of people grow up with considerably worse upbringings and do just fine in life without crying about it (and don’t make 8 figures a year I assure you). The fact that he scored 40+ points in a game and upheld a stoic expression throughout the game was for some reason an incredible feat worth writing about. It’s his ninth season. If he deserves to be classified among such greats as Bird, Johnson, Jordan than a stoic professional attitude in a 40+ point should be commonplace. Until then, I will never use his name in the same sentence as such legends. Unfortunately thats right before he goes on a run against fats only to be demolished after he gets drunk. Maybe thats how game 7 goes for LeBron. Could it be that the reason LaBron doesn’t do as well in the 4th quarter is he never gets a rest? Isn’t it a no-brainer that he’d play better late with some sort of break against players that have gotten that break? Know what Joe? After last night I hate him even more. Where the hell was this when he played in Cleveland? It was in Detroit, I believe. Sure, I resent the quitting later, but the Finals trip? You remember that was special, right? I feel sorry for you, Chuck. You hate him when he plays well, and if he played poorly, you’d laugh at him and mock him mercilessly. What a sad life. Seems to me Lebron played that way in Cletown a whole lot more often than since that final year with the Cadavers and now in his years in Miamiville. Im still hoping to see joe write about the stanley cup playoffs. Joe, I just watched that scene from the Hustler and goddamn if that isn’t just about the best soliloquy I’ve ever seen in an American movie. I’d seen that film a couple of times but I guess I wasn’t in the appreciation space for it because this time it just popped and I want to thank you. Thank you. You’re a goddamned mensch is what you are. Thanks for the thought that The Hustler might be the greatest sports moview of all time. I’ve always considered it one of the greatest movies (any genre) ever, but I never thought of it as a sports movie. Of course it is. And you might be right. It made me wonder what I think is the greatest sports movie. This sets the bar awfully high, because it has to be near the top of the greatest movies period. We all have opinions about that. Raging Bull (Scorsese, Deniro, Pesci) has to be considered. Requiem for a Heavyweight is from a long time ago and many of your readers may have missed it (Anthony Quinn, Jackie Gleason, Mickey Rooney and written by the immortal Rod Serling) was brilliant in all ways. (Gee, there’s Gleason again!) Rocky won an Oscar. Hoop Dreams should have won one. I’m sure your readers have opinions about this, and I’d like to hear them. This would make a great survey. To get you started, here is a list from your former employer, SI, printed in the August 4, 2003 issue of their top 50 sports movies. The Hustler is sadly #23, but it is an interesting list and includes other movies like Horsefeathers, Searching for Bobby Fischer and Best In Show that you might not think of. Joe, I think you might have it right. I think Gleason’s performance puts it over the top. That said Hoop Dreams was pretty amazing. Major League is a better flick than at least 30 of these movies. Good stuff, see this is why Joe is great. Reminds you of a great movie, i find out for the first time about that USC cheerleader even though i don’t really like basketball. As a Pistons fan, I saw this once before. Game 5, scored 29 of the Cavs last 30, including the final 25 in a row, and played the entire Pistons team shot for shot for the 4th quarter and ot. It remains the single greatest display of basketball I’ve ever seen, and the single most destroyed I’ve ever felt as a basketball fan. My beloved Pistons came so close to being a dynasty, and that night Lebron was better than the entire team put together. That was 17 minutes of what he unleashed for an entire game Thursday. When he goes into that “muder-death-kill” mode, he’s the best player I have ever seen, Jordan included. The difference, of course, is that Jordan lived in that mode, and it took Lebron half a decade to get back into it again. You can still be dialed in and enjoy the game. I submit for evidence, Dustin Pedroia. You can’t compare baseball to basketball when it comes to being “dialed in”. LeBron played basically the entire game. On most days, Pedroia impacts less than 10% of the plays in a baseball game. Sure, he can be focused when he’s on the bench, but does it really matter whether he is or isn’t? With LeBron, it clearly mattered. I can’t stand it when people talk about “spoilers” in old movies. There is no such thing as a spoiler for a film that came out fifty freaking years ago. Newman’s monologue is every bit as powerful as Brando’s “I coulda been a contender” speech from “On the Waterfront” only without the self-conciousness and mannerisms. Rafael Nadal deserves a post in this blog. When a 45 point game achieves this level of respect it makes you want to reevaluate Wilt Chamberlain’s 100 point game. This was a playoff elimination game on the road. Wilt’s 100 point game is more like Kobe’s 81 point game. Great stuff Joe, and also glad to see people voting for The Wire over Mad Men. LeBron may be simply too nice to satisfy the part of us that wants gladitorial triumph. If he has his choice, when he’s doubled, rather than bull his way to the basket and embarrass the defenders, he’ll pass to whoever’s open. He doesn’t want to embarrass anyone — no, not Cleveland, either. And so what? He doesn’t set out to kill his opponent, and if his teammates don’t come through, they lose a few more games than they might if he were more selfish? Who cares? We see great basketball talent. I have no money on who wins.